Thanks to our sponsors, we’ve built up a little bit of a budget to make some buttons available through our Facebook page and to a great cause we support 100% – the World Record attempt by Paul O’Shaugnessey and Lenny McNevin in Oshawa. If you haven’t heard about it yet, follow the link at the end of this article. Here are 2 guys who are really putting something back into the sport and helping promote darts and acting as an inspiration to us all. Apart from the tremendous publicity they’re generating locally, The Big Push For Darts in Canada has donated 200 buttons to help them raise funds for the veterans club. We’re glad we can help, and we support darters who are promoting this sport we all love. These 2 ‘regular guys’ from Oshawa, Ontario are teaching us a valuable lesson: That you don’t have to win tournaments, play in the professional circuit, or even win world championships to be an inspiration – every one of us can do something small. It might be wearing a dart button on your shirt, it might be hanging posters at dart venues, it might be handing out flyers, or talking to beginners you see playing and give them a 5-minute intro to the game. In the end it will be a lot of small things that get combined with a few big things that “pushes” us forward. Is time we all started promoting the heck out of darts. In the meantime, thanks Lenny and Paul for giving us one of those Big things! We’ve been getting word back from across the country that our modest Dart Players Wanted posters are starting to yield results. Last night we got word from Robert Savoy of the York Region Dart League (YRDL) in Aurora, Ontario who thanked us for directing a couple who wanted to play darts a couple weeks ago. They’ve since joined and are now playing in his league now, along with dozens of others across the country. A few weeks ago we had asked members of the Big push on Facebook to wear their custom button as their profile pic. If we found you “With your button on” we’d mail out a custom button with your name on it to help spread the word. We had sent one to Mark Briggs from Moncton, New Brunswick in one of the first days of the program. He got back to us saying that his league wanted to order about a custom button for each player in the league. That’s bumped our numbers up 45 active players with custom buttons, and yet again proves New Brunswick is a hotbed of support for darts. We thanked Rick Kirkpatrick and crew of NB Darts for being the first provincial body to embrace the Big Push For Darts fundraising ideas and running with the first 100 custom buttons in July. They helped kick off the concept and showed the buttons worked for both raising awareness of the sport of darts as well helping worthy groups raise funds to support their programs. And we were excited when last week they placed an order for 300 more buttons. They became not only the first group to step in and use buttons, but also the first to re-order more. I guess the bottom line is this – Big Push Buttons work! They’re not just cool little keepsakes, but a badge that shows the world you play and are proud to be a dart player. This weekend is the George Ramsay Memorial in Moncton, NB, and we’ll get some feedback soon on how the buttons went over. Unlike the July event, this event is NDFC ranked and is drawing some of the best players in the country in their quest to get those all-important national ranking points. 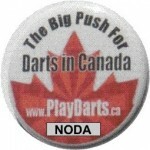 I had a long Facebook chat with Preston Noonan, an executive from NODA (Northern Ontario Darts Association) the other day, and he thought the idea of using Big Push For Darts in Canada buttons was a no-brainer. We’re sending 50 buttons up to Preston and they’ll have them for the beginning of the darting season. NB Darts recently used the buttons for a successful fund-raising event already, so I think NODA will find their experience pretty similar. If you’re part of NODA, see one of your executives and get hold of one or more of these buttons. NODA is now the second Provincial body supporting our grassroots movement. In another little while we’ll start unrolling new programs for The Big Push For Darts in Canada. The first one will be a great project we hope will really get more folks involved over time. Remember, everything we do is Grassroots, which also means we’re independent from, but co-operative with official bodies. In the meantime, use from the main page use the Contact Us feature to let us know you’re interested in getting a Dart Players Wanted post to hang at your local dart hotspot. Phase 2 of our movement is to connect players with leagues and teams. We created an online survey that asks players who want to play to give us some basic information about themselves so we can pair them up with leagues and teams. It’s on a secure site, and we won’t share their info with anyone without their permission. But the idea is simple: Now members of our grassroots movement can request a poster, get one by e-mail, print it off and hang it in their favourite dart venue. When players respond, we try as best we can to find a league for them in their area. I’ll keep you advised on the progress we’re having with this. I’ve been working on a side project this past week or so that should serve to be one of the corner-posts of our Big Push Campaign. 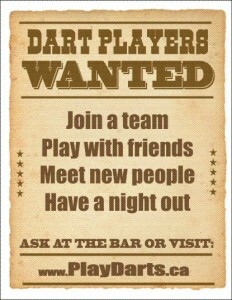 It’s a standard Dart Players Wanted poster that we’ll make available across the country. 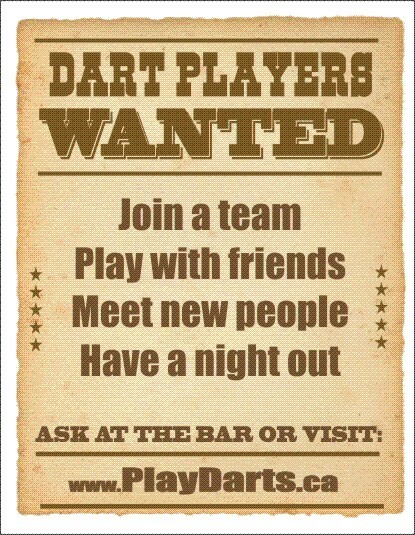 Then when people see it they can go on PlayDarts.ca and either find a league in their town and click a link to contact them directly, or send us a quick e-mail. If we know of a league in their town, we’ll forward the information. If not, we’ll look for a league. The benefit to this approach is PlayDarts.ca is an easy website name and gets remembered. What we need folks to do is to help us build a database of leagues for potential new players to choose from. Well, congrats to all of us as we’ve hit our 2,500th Facebook member – and it’s still summer! Wow. All of you please take a bow. This has been the first really truly viral darts movement in Canada. What I mean is when you tell a friend, they tell a friend, and so on. Like catching a cold, but something good. Almost like a Dart cold. Although I’ve been confident all along, the proof has to be in the pudding, and this past week has really proven that I think we may be on to something here with the Big Push. It’s pretty rare in darts in this country to have people eager to jump on board with anything new. As I’ve approached some potential sponsors of our movement – apart from the provincial bodies – to join in and help spread the word, all I have to say is the feedback I’ve received has been excellent! It should make us feel even more confident that, as they say, “It has legs”. The buttons we’ve been doing are just the beginning. They’re cool on Facebook and they’re cool when people wear them on their shirt, bags, purses, and especially on dart cases. Let’s all get ready to do something really special in the early fall. To this point we have made contact with most official provincial or territorial bodies in the country about joining with us to make actual Big Push buttons available to members. Well 9 so far that is. We’ll be hitting the rest in the upcoming weeks and letting you know about our progress, even roadblocks, if there are any. We’ve only started working with 1 provincial group, New Brunswick, but we’re confident others will join in as well. I’ve made phone calls and sent e-mails to most of those groups, and will wait for them to get back to us. I’ll give a gentle nudge around late August as a reminder. It may be important to mention that folks who run the provincial bodies are volunteers and not employees, and fit their dart responsibilities in around their life responsibilities. In my opinion, that’s the way it should be. We should see some more uptake at the provincial level because this is truly a Win-Win-Win situation for dart groups, dart players and The Big Push. And hey, it’s still summer. Most groups won’t start meeting until late August. We’ve got a long way to go, and I’m not opposed to taking the scenic route.